Recording music from your computer to a tape deck requires a few very simple steps. Aside from needing a cable with stereo RCA connections on one end and a mini-plug on the other end, all the software you need is probably on your computer. 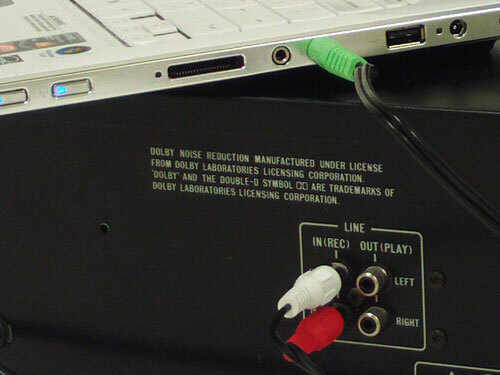 To connect your PC to a cassette tape deck for recording to tape, you need a cable with a standard 1/8-inch Mini plug on one end and stereo RCA connections on the other end. The RCA connectors will attach to the line in or record connection on your tape deck, the mini plug will attach to either the headphone jack or the line out on your PC. The only software you will need on your computer is your favorite media player like iTunes or Windows Media Player. Just compile the list of audio tracks you want to record to tape in the media player, hit recording on the tape deck and click play in the software. Do You Use Pre-Installed Software?